Railroad builders approaching the Port of New York from the west faced a gauntlet of physical barriers. Rivers, swamps, and a scarcity of water frontage challenged engineers as they worked to bring tracks to the edge of the Hudson River. But no obstacle proved more challenging than Bergen Hill. 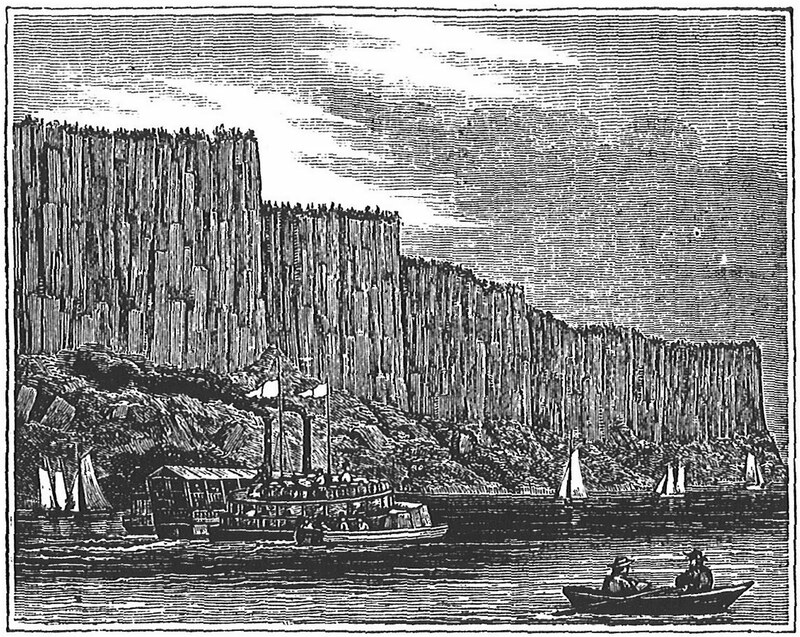 A ridge of solid rock thrusting upward from the Jersey mud flats along the river's western shore, Bergen Hill stretched nearly the entire length of Jersey City, forming the Hudson Palisades and separating the riverfront from the interior. Created around 200 million years ago by the injection of magma between layers of sedimentary stone followed by gradual exposure through rifting and tilting of the layers, the Bergen Hill's hard diabase rock created an almost impenetrable cliff over which grade-sensitive trains could scarcely hope to cross. (1) New Jersey's first railroad, the Camden and Amboy Railroad (C&ARR), elected to avoid the hill entirely and built its terminal at South Amboy, where ferries filled with passengers and freight from Philadelphia traveled the remaining distance to Manhattan over water. Palisades and Hudson River, 1868. Bergen Hill comprised the shorter southern end of the same long ridge (Barber and Howe 1868: 74). A NJRR train enters the Bergen Cut through Bergen Hill in the late 1830s (Cunningham 1997: 30). The Bergen Cut was a significant engineering accomplishment for its time and provided the first and only practical rail route through the Bergen Hill for over 20 years. (3) As a result, other railroads sought access to the Cut for their own purposes. (4) The C&ARR constructed a second branch to a connection with the NJRR in New Brunswick and formed the first all-rail route between the Port of New York and Philadelphia. At first, the C&ARR funneled most of its passenger traffic by this route through to Jersey City, but it continued to send the bulk of its lucrative freight business through its own terminal at South Amboy, thereby starving the NJRR of profits. (5) It was, however, an inefficient system and the C&ARR used its enormous political and financial muscle to gain control of the NJRR and its route through Bergen Hill in 1867. (6) The combined railroad was able to monopolize much of the enormous flow of goods and materials traveling between New York Harbor, Philadelphia, and the west. For full bibliographic citations, click on the Bibliography page.